DUBLIN, Ireland -- Ireland's president during World War II offered condolences to Nazi Germany over the 1945 death of Adolf Hitler, newly declassified government records show. Historians had believed that Ireland's prime minister at the time, Eamon de Valera, was the only government leader to convey official condolences to Eduard Hempel, director of the German diplomatic corps in Ireland. De Valera's gesture, unique among leaders of neutral nations in the final weeks of World War II, was criticized worldwide. The presidential protocol record for 1938-1957, made public this week within a trove of previously secret government documents, shed new light on one of the most embarrassing chapters in the history of independent Ireland - its decision to maintain cordial relations with the Nazis even after news of the Holocaust emerged. The new document confirmed that President Douglas Hyde visited Hempel on May 3, 1945, a day after Ireland received reports of Hitler's death. Although a member of the British Commonwealth, Ireland (Eire) remained neutral throughout the war. The Prime Minister, Eamonn De Valera, refused repeated requests by Britain for the use of port facilities at Cobh, Berehaven and Lough Swilly on the west coast of Ireland during the Battle of the Atlantic, ports that Britain considered essential to her survival. (These ports were closed to the Royal Navy in 1939 just as Britain was preparing to go to war). In December, 1941, Hitler had considered invading Ireland and using it as a platform for the assault on the British mainland. If this had proceeded it would have marked the end for Britain. It was Admiral Räder who changed Hitler's mind, pointing out that in the face of Britain's huge naval superiority it was quite out of the question. The help De Valera gave the Germans was to refuse Britain the use of airfields and submarine bases in Ireland which would have set back the U-boat operations in the Atlantic. The use of the Berehaven port for instance would have enabled our anti-submarine escorts to operate a further 180 miles out into the Atlantic. How many ships and seamen's lives this would have saved is a matter of conjecture. During the 'Emergency' enlistment in the British Army however, was popular and around 42,000 Irishmen joined the armed forces or went to sea in the Merchant Navy. Eight won the Victoria Cross, Britain's highest award. These servicemen, when returning home on leave had to wear civilian clothes to avoid any political embarrassment should they come home in a British uniform. Thousands more went to England to work in British munitions factories during the war. Whenever an Irishman died in battle he was reported in De Valera's press as having died while working in Britain.. The Republic of Ireland, then called Eire, remained neutral throughout World War II. Tens of thousands of Irishmen volunteered to serve in British military units, but many others rooted for Germany against their old imperial master Britain. 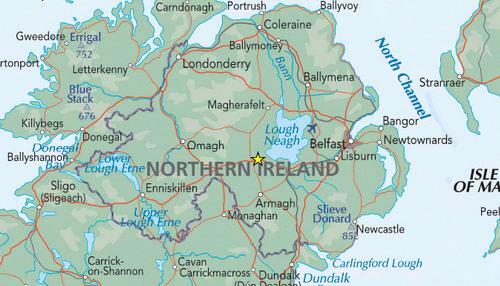 The outlawed Irish Republican Army built contacts with the Nazis in an ultimately fruitless effort to receive weapons and money for insurrection in neighbouring Northern Ireland, a British territory. De Valera's government brutally suppressed the IRA but also rebuffed requests to allow Jews fleeing Nazi persecution to receive asylum in Ireland. De Valera also refused to allow Britain or the United States to use strategic Irish ports for protecting Atlantic convoys from attacks by German U-boat submarines, a policy that cost thousands of Allied seamen's lives. In his May 1945 victory speech, British Prime Minister Winston Churchill condemned de Valera's neutrality. Churchill said Britain had considered laying "a violent hand" on neutral Ireland to seize its ports, but avoided this thanks to the crucial support of Northern Ireland, which remained part of the United Kingdom when the island was partitioned in 1921. But de Valera argued that to refuse condolences "would have been an act of unpardonable discourtesy to the German nation and to Dr. Hempel himself. During the whole of the war, Dr. Hempel's conduct was irreproachable. ... I certainly was not going to add to his humiliation in the hour of defeat." Another neutral nation did allow U-boats to refuel in at least the port of Vigo, Spain. This was all done very clandestine at night from interned German merchant vessels there. Adolf Hitler planned to use the IRA to invade Northern Ireland with 50,000 troops during the War, secret papers sensationally revealed today. But the covert Nazi plan collapsed because of the incompetence and treachery of republican leaders during World War II, according to the MI5 files made public today. Wartime documents released to the National Archives (formerly the Public Record Office) show that a German agent was sent to Ireland to co-ordinate an operation which would see thousands of Nazi troops land at Larne, Londonderry and Coleraine. But the agent found that the IRA was riddled with informers and led by a drunk. In May 1940, Hermann Görtz, who had been jailed for four years in Britain for spying before the war, was parachuted in to assess the prospects for 'Plan Kathleen', as the operation was codenamed. It followed the visit to Germany earlier that year of an Irish go-between, Stephen Held, who told German army chiefs that the IRA could assist in an invasion. "Held painted a rosy picture of a powerful IRA, numbering about 5,000, ready in southern Ireland to give the Germans immediate assistance, provided they procured arms," a subsequent RUC report noted. "The plan of campaign was that the Germans should land 50,000 troops at about five different points - Larne, Coleraine, Derry and Sligo were mentioned." However, when Görtz, landed he did not know whether he was in Northern Ireland or the south and the first person he asked for help turned out to be the local "village idiot". Within two weeks of his landing, Held was arrested by police at his Dublin home where they seized Görtz,'s radio transmitter, 20,000 US dollars and his hand-written notes for Plan Kathleen. Görtz, blamed "treachery within the small circle which surrounded me" for the setback. The MI5 files reveal how he found republicans divided on whether they wanted the Germans to invade Northern Ireland or just to provide the weapons, and whether they should even be attacking the British or concentrating on the overthrow of Eamon de Valera's Dublin government. He said he did not know whom he could trust. He wrote: "There was something dangerously rotten in the organisation of the IRA. Immediately beside the idealistic Irish fighter for freedom, man or woman, who are ready to die the martyr's death for their country, stands the completely corrupted betrayer." The three-man team of saboteurs, including one Briton, were captured after they landed on Ireland's south west coast in July 1940 and interned in Dublin's Mountjoy jail. There were no Irish units in the Waffen-SS or Wehrmacht, although there were Irish volunteers. Ulster or Eire - that they elected a 'Senior British Officer' to represent them. This was initially a Lieutenant Bissell, but subsequently Major John McGrath of the Royal Engineers. The Irishmen were subjected to intense psychological pressure and eventually, in December 1941, five of them were removed to a safe-house in Berlin. Their names were Brady, Cushing, Walsh, O'Brien and Murphy. Instead of being formed into a military unit, as the Germans had originally envisaged, the five then began training as Abwehr spies; in early 1942, a sixth man, Frank Stringer, also joined this process. It is worth mentioning at this point, that all of the 'volunteers' had actually discussed the matter with Major McGrath and that at least four of the men (Cushing, Walsh, O'Brien and Murphy) had no intention of genuinely changing their allegiance but were seeking a means of escape. As a result, none of the Irishmen were actually dropped as spies, and both Cushing and Walsh ended up as inmates of Sachsenhausen concentration camp. Brady and Stringer continued to work, on and off, for the Abwehr, but eventually their services were dispensed with and, rather than doing agricultural work as POWs, both opted to join the Waffen-SS. They reported to Sennheim in October 1943 and were posted to 'Jagdverbände Mitte' in March 1944, under the aliases 'Charles Strength Lacy' and 'Willy Lepage'. Brady certainly took part in operations in Rumania, as well as 'Operation Panzerfaust' - the arrest of Admiral Horthy, whilst Stringer appears to have had a quieter time, working as a cook. In early 1945 both were fighting on the Eastern Front as members of Otto Skorzeny's ad hoc division at Schwedt an der Oder. By this time, Brady was an Unterscharführer. As the war came to an end, Stringer escaped westwards and gave himself up to US forces, who handed him over to the British, whilst Brady, who was wounded, was in an SS hospital. He escaped after the Russians had taken it over and spent more than a year 'on the run' with other Waffen-SS 'special forces' soldiers before giving himself up to the British in Berlin. He received a fifteen-year sentence at a court martial in London in 1946. One other Irishman is reported as having served in the Waffen-SS: 'Patrick O'Neill' was supposedly a doctor in SS-Bewahrungsverbände 500, a penal unit. I have seen no documentary evidence that this was the case but it is quite possible. Other Irishmen worked for the Germans as spies and radio propaganda broadcasters, but their numbers weren't huge and probably came to less than ten or fifteen. Contrary to popular supposition, no Irishmen served in the 'British Free Corps'.